Although relatively new to Junior League of Long Beach, she joined in 2015, Kristi has made an immediate impact on the organization. She was a member of the Strategic Planning Committee and 2017 Southwest Conference Exchange. Kristi has served as the Assistant Treasurer, The Treasurer Elect and is currently the JLLB Treasurer for the next two years. 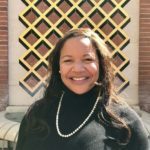 Professionally, she has worked as a higher education Administrator for over 20 years and is currently the Senior Assistant Director of Financial Aid at the University of Southern California, her alma mater. She currently serves on the USC Provost’s Diversity Task Force and the USC Staff Assembly. Kristi is pursuing her Doctorate in Education at USC.